This longtime manufacturer of musical instruments at one time stretched the definition of the term to include a line of radio receivers. 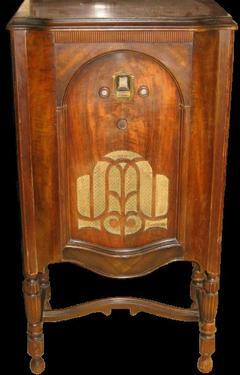 Though much refinement was still to come, radio technology truly came of age in this set's generation. A superhet with an RF amp, its schematic bears much closer resemblance to designs from 30 years and more into its future than it does sets of just 3 years prior. Screen grid tubes were still a new technology at this time and it is remarkable just how sensitive the early types were. Even if the 47 output tube has earned its poor reputation for sound reproduction, it too represents a leap forward as the first power pentode and it would soon give way to improved types like the 42.